Change cannot come quickly enough to South Boston, where a spate of recent crashes — including one in July that killed a toddler — has the city eyeing long-awaited improvements to roadways throughout the neighborhood. Immediate implementation of the redesign of Preble Street including parking protected bike lanes. This will make the road narrower and help slow cars as well as increase pedestrian safety. Consider redoing Day Blvd with a 2-way cycle track (protected bike lane) on the beach and add parking on the non-beach side. If that is not possible, then protect the existing bike lanes with posts to keep cars out and make a separated bike path once bikes are routed onto the sidewalk so pedestrians and cyclists are not in conflict. If South Boston residents and visitors alike can get safely to the beach, more people of all ages and abilities would bike there. Create a 2-way cycle track on Farragut Rd to slow traffic and make pedestrian crossing shorter throughout the length of the road (recently they made the crosswalk shorter and safer but bike lanes would also narrow the entire street and slow cars). Continue bike facilities down Summer St to L Street to create a connected network to downtown Boston. 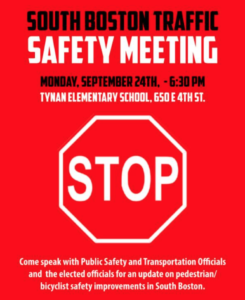 This meeting is not intended to replace the recent Day Blvd meeting with MassDOT that was canceled at the last minute. This meeting is a follow-up to the City-hosted meeting in August. We have not heard anything about a new Day Blvd meeting being scheduled. Contact eparad@bostoncyclistsunion.org with any questions or concerns.